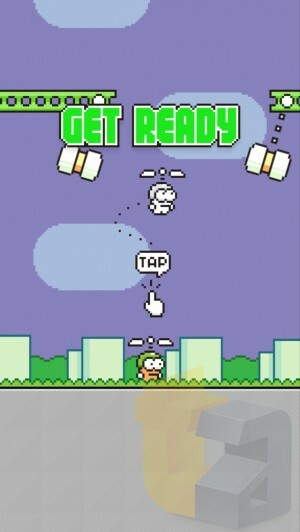 Just when you thought the "flappy" craze was over! The creator of the illustrious Flappy Bird is back again, with a vengeance. This time around, Dong Nguyen's game is called Swing Copters, and while it looks and plays similarly to Flappy Bird, it's a different beast entirely. It'll also cost you $0.99 to remove the ads that come in-game with the free version. You play a little guy with a propeller hat who's tasked with going ever higher on the screen through platforms that you're forced to avoid hammers and pendulums with. And guess what? It's every bit as frustrating as the last game, according to TouchArcade's assessment in the video above. You simply need to clear gates, then best yorur score from there. There are several medals to win as you make your way to the top, but it's a little early to tell exactly how the game will play out simply via the first-look video. Swing Copters is releasing tomorrow, so look for a review at Modojo ASAP!